While lines were long for the iPad 2 launch in the United States on Friday of last week, availability has been very scarce in the days since, with hopeful customers lining up outside Apple's retail stores each morning hoping that stock has arrived. And even when stock has arrived, customers have typically had to be very close to the front of the line to even have a chance at securing one of the hard-to-get devices. 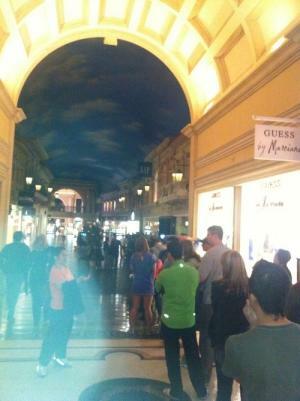 Several MacRumors readers have written in and shared photos of the experiences trying to obtain an iPad 2, and frustration seems to abound as the long lines continue even a week after launch. Readers have reported that the line at Apple's flagship Fifth Avenue store in Manhattan is essentially a perpetual mass of people numbering in the hundreds, with customers camping out and swapping positions in-and-out day after day as they wait for more stock to arrive. 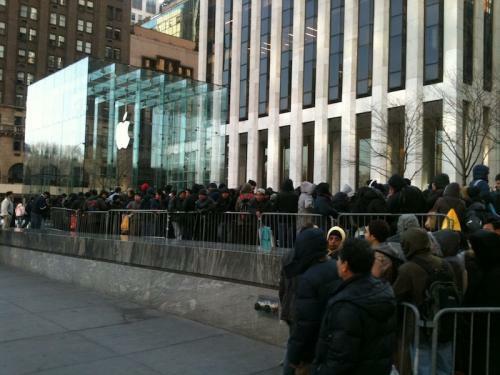 Apple has erected barriers to contain the line, and once the line reaches the end of the barriers each day after stock has been distributed, no new customers are permitted to join the line. Customers are especially keen on trying to pick up iPad 2 units from in-store sales, as shipping estimates for new online orders were quickly pushed out to 4-5 weeks. We've heard that some Apple retail stores are holding iPad 2 shipments received during the day until the following morning, with some stores opening early when they have stock in order to disperse their supplies and customer lines as much as possible before they open for regular business. Some forum readers have also being using inventory tracking features to try to pin down supplies at Target stores around the country.